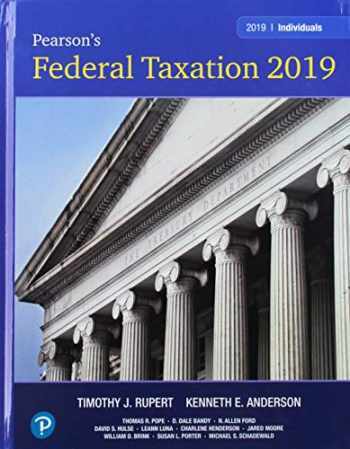 Acknowledged author Thomas R. Pope wrote Pearson's Federal Taxation 2019 Individuals Plus MyLab Accounting with Pearson eText - Access Card Package (32nd Edition) comprising 9998 pages back in 2018. Textbook and etextbook are published under ISBN 0134855477 and 9780134855479. Since then Pearson's Federal Taxation 2019 Individuals Plus MyLab Accounting with Pearson eText - Access Card Package (32nd Edition) textbook was available to sell back to BooksRun online for the top buyback price of $3.00 or rent at the marketplace.